Recently I’ve had the opportunity to try the latest OS from RIM, the BlackBerry OS 7, on the Curve 9360. The Curve 9360 is a small qwerty smartphone that, as far as I’ve tested, provides a decent overall performance. 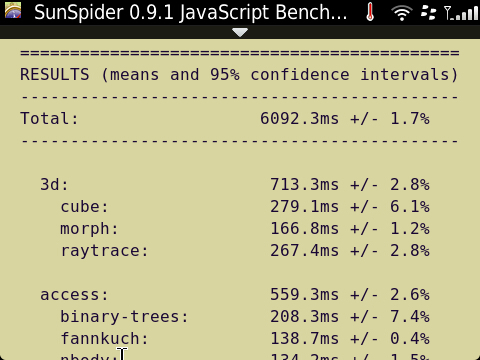 The thing that really surprised me was the overall compatibility with the websites I tested the stock browser with. 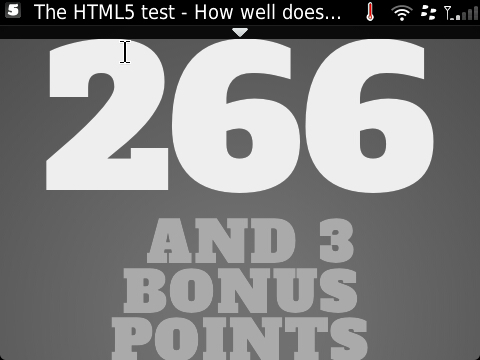 It actually supports HTML5 and got a neat result in the html5test.com website as you can see below. This entry was posted on February 28, 2012 at 14:00 and is filed under BlackBerry. You can follow any responses to this entry through the RSS 2.0 feed. You can leave a response, or trackback from your own site.